The account of Jesus healing a crippled woman on the Sabbath is a Bible story that most of us are familiar with. However, a careful re-reading of this story with some cultural details added brings out some delightful surprises. Let’s take a look. When Jesus healed the woman in Luke 13, The NIV says that He said to her, “Woman you are set free from your infirmity.” The literal Greek translated there is, “woman you are ‘untied’ from your infirmity.” Knowing this one word is a huge key to understanding the rest of the story and how He used it to make the Pharisees look bad. 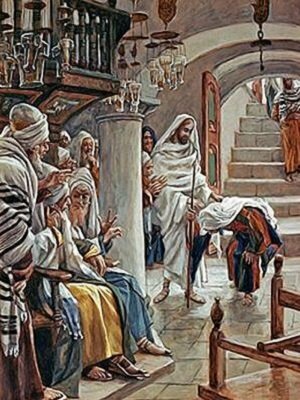 Jesus then calls the Pharisees hypocrites because that very Sabbath morning they had “untied” their livestock and had taken them out to eat and drink and relieve themselves, yet they were criticizing Him for “untying” this woman and releasing her from her infirmity! “Which is more important to do on the Sabbath?”, Jesus asked, “untying your livestock or this woman?” His opponents were humiliated and all the people listening were delighted at Jesus’ common sense new interpretation of the Sabbath laws. A cultural detail that is interesting and important to this story is that in the Middle East, during this time in history, people kept some of their more important animals in the house with them at night. People slept in a raised area of the house and kept their animals in a step down area by the entrance (see diagram in the story of “No Room in the Inn”). Every morning when they began their day they would untie and let the animals out of the house to relieve themselves. The Sabbath would have been no exception; they had to be let out every day. Jesus was saying to the Pharisees, “Look how unreasonable and unbending you are. You have no problem untying your animals on the Sabbath, yet you won’t let me “untie” this woman from an infirmity that has plagued her for years!” What is the difference? His adversaries were put to shame! This story is a great example of why Jesus was well thought of and followed by such a huge crowd of people. They were amazed at His authority and His ability to make such brilliant and fresh new interpretations of the Laws of Moses.